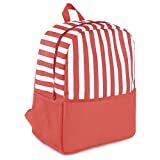 Family Size Cool Backpack Ideal for the beach, camping and picnics. 600D Polyester With PVC wipe-clean foil lining to aid insulation. Family Size Cool Backpack Ideal for the beach, camping and picnics. 600D Polyester With PVC wipe-clean foil lining to aid insulation. Stripe Design With 2 way zippers, Front And Side Storage Pockets.